Finally, straight talk on how to start your own craft business doing something you love! If you've ever thought about starting and running your own successful craft business  while avoiding some of the most common mistakes made by business newbies and using some of the most powerful marketing techniques available  then this might be the most important letter you'll ever read. How to Start Your Own Craft Business is the definitive guide to showing you the ropes to starting, running, and marketing your own successful craft business. This book is packed with as much information as is humanly possible about making money with your crafts - showing you the fastest and easiest way to get your profitable craft business off the ground. Look, I know you are passionate about your crafting , and want a way to take your hobby to the next level. Your friends and family tell you that your hand-crafted items are works of art and that you should sell them. They may have even offered to buy some of your craft items from you. That's why you want to take the leap of faith and start your own craft business selling your own crafts to your local community (or even over the Internet!). For you, it's time to stop working for someone else, and start building a future that will replace your current income and allow you the freedom only true entrepreneurs enjoy. Your Own Craft Business Answered"
After you confirm your request, you'll be sent an email with directions for downloading the special report. PLEASE NOTE: You must confirm your subscription in order to receive the download instructions, so please check your email after completing this form. YES! Send me the Special Report. Maybe you've just started to explore the possibility of starting your own craft business to see if you're ready for the commitment. Or perhaps you know you're ready, but want to be completely prepared when you start to put your craft business together and start spreading the word out about your new business. own craft business available on the market today! Reason One: I am the author of the highly-successful quilting business books, "How to Start Your Own Machine Quilting Business," "How to Start Your Own Quilt Shop," and "How to Start Your Own Quilting Business." With over 2,431 copies sold since 2003, these are the leading resources for quilters looking to start their own machine quilting business or quilt shop. I know how to get people started in a craft business. Reason Two: I have over 17 years of experience in marketing and business management. To me, there is nothing as important as being able to bring customers into your new business in the most effective, least expensive, manner. This business guide offers my expertise in the top marketing methods for a new craft business, including Internet marketing and selling your crafts on eBay. Reason Three: I've spent over a $1,000 and 100s of man hours (worth $1,000s more!) pulling together the most exhaustive, thorough guide to starting, running, and marketing a craft business available anywhere. I've tried to leave no stone unturned when it comes to finding out the most effective information to lead your craft business to success. You can take advantage of this investment at a fraction of the cost. General business books don't go into enough detail about the specifics of starting, running, and marketing a successful craft business. This book delivers the step-by-step instructions you need to get your craft business up and running in the least amount of time. Never run a business before? You don't have to worry about getting bogged down with over-complicated terms or unnecessary information. This book provides an easy-to-read primer to help guide you through some difficult concepts of starting a craft business and running it effectively. Starting any new business can be a bit intimidating, or even downright scary. How to Start Your Own Craft Business takes you by the hand and lets you know everything that you'll need to do to start and run a successful craft business. With all the right information, you can make a decision on whether or not a craft business is right for you. Craft fairs are one of the best markets for selling your crafts. Find out how to properly exhibit your crafts for maximum exposure - and maximum sales. Also, learn sneaky craft fair market research tricks to help you find out what items are selling for in your area - an aid when pricing your crafts. Discover some interesting facts about the craft market, and how you can get involved in this $21 billion plus market. When you know who your customers are, it makes it easier to gear your new craft business towards those most likely to purchase your wares. How to Start Your Own Craft Business is written with the business novice in mind. You know crafts and love your hobby. But, you may not know how to start and run a successful business. This craft business start-up guide is designed to give you that knowledge and to help you decide if you want to make that leap from crafting hobby to full- or part-time craft business. "How to Start Your Own Craft Business"
"I found the information contained in "How to Start Your Own Craft Business" the most complete resource available to make your business successful. It guided me thru all the processes and made it very easy." "Well thought out and well re-sourced and easy to use and understand." "I have really enjoyed reading "How to Start YourOwn Craft Business." It is well set up and easy to follow. I have got alot of ideas and it has helped me alot with my own craft business. Thank you Chuck for showing me how to get started with my business." "I have had several home-based businesses during the past ten or so years and feel confident that I had a good understanding of my new craft business. It wasn't until I read Chuck Smith's "How to Start Your Own Craft Business" that I realized how little I knew about the craft business. Chuck Smith is able to take complex issues and explain them in an easy and readable way. If you are starting, or thinking of starting, a craft business I recommend this book. It would be a valuable resource at twice the price." Thank you for all of your hard work in putting together this great book "How to Start Your Own Craft Business". It is easy to read and understand. It makes total sense. You have given me much to think about and have confirmed some of my ideas. This makes me realize that i am heading in the right direction. "This is a great product. I had plenty of great creative ideas but had no idea where to start in order to make them profitable. I feel now that I am on the road to a fulfilling career. " "Great book! Good advice for the beginner. Although my business has been going several years,it gave me lots of ideas and thoughts." Thank you so much for the amazing book ! It is loaded with great information and is very easy to read and understand. I strongly reccommend it to anyone who is thinking on starting a craft business. It has everything you need to know in order to get started and be succesful. This is an excellent "How to" package ! Thanks to your book I am now in the process of starting my own online craft business." "I have had a small craft business for over 10 years, without having a business plan. Since reading the craft business plan and time management the pencils have been sharpened! My days are far more orderly and I actually take my business more seriously. I noticed improvements inside a few weeks. Thank you Chuck, the small outlay to purchase your package, has added profits and satisfaction." "Thanks to How to Start your Own Craft Bussiness, I am now on the right path on selling my crafts. Before receiving this I did not know my hand made jewlery cases which I made for friends and family could make me $money. Thanks!" Comprehensive Guide: If you are going to start a craft business, you need to know how to come up with ideas for which craft to focus on, how to maximize profits for your business, where and how to sell your products, and especially how to market your new business. The How to Start Your Own Craft Business gives you this basic business information geared towards your success. Information on Running Your Craft Business: One of the things that can kill a business faster than a natural disaster is not knowing the ins and outs of running a successful business. 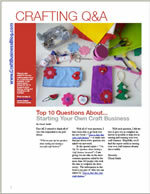 The How to Start Your Own Craft Business provides insight on the ins and outs of running a successful craft business. Marketing, Marketing, Marketing: Without a doubt, good marketing can help you create and maintain a successful craft business. This package offers the top methods to get the word out about your new craft business and drive swarms of customers to your crafts. How to Start Your Own Craft Business is the result of years of real-world experience and lots of time spent in the School of Hard Knocks. When you purchase, you get a comprehensive guide to starting, opening, running, and marketing your craft business. Other craft business books on the market don't offer the depth of experience that has gone into the How to Start Your Own Craft Business. You receive the complete How to Start Your Own Craft Business guide that will take you step-by-step through the process of starting your own successful craft business. You get proven, tested marketing research strategies and marketing advice geared towards crafting businesses. And you get a list of some of the most valuable resources for your new craft business. If you respond right away, you pay only $67 $47 for the electronic version, available for immediate download . My customers and the professionals who have previewed this craft business package tell me I could sell this information for at least $50 more, so who knows how long this price will last. Not sure what type of crafts you are going to sell? This short downloadable audio program gives you the a system to discover the best crafts to sell in your area. I have created a short primer on how to start selling on eBay, which was a great way to learn how to get up and running on The World's Online Marketplace®. In addition, I've collected over 50 articles on eBay selling which are included. How to Start Your Own Craft Business is available for immediate download. When you click on one of the order buttons, you will be taken to a Secure Ordering Page. You can use your credit card or PayPal to order online, which is the quickest way to get this powerful information into your hands. ORDER RIGHT NOW - ONLY $67 $47! How to Start Your Own Craft Business is available for immediate order and download from a Secure Ordering Page (256-bit encryption so you know your credit card information is secure). You can order using most major credit cards or via PayPal. To order the your copy of How to Start Your Own Craft Business, please click here or on the button below. P.S.My customers and friends tell me I'm crazy to offer so much for so little. I have piled on the bonuses (worth $136), and over-delivered on the content of this book. I am testing How to Start Your Own Craft Business at this price with this bonus package for a limited time. Order now to make sure you get your copy! © 2011 Gryphon Publishing Inc. All Rights Reserved. By entering, you agree to our Terms and Conditions. By entering your email address you are also requesting and agreeing to subscribe to our free Craft Business email newsletter. You must be 18 or older to enter. Check out our Free Craft Business Blog.